The Storm Prediction Center has increased the changes of severe weather this afternoon and tonight. The graphic below shows the tornado threat area where 5% is the significant value. 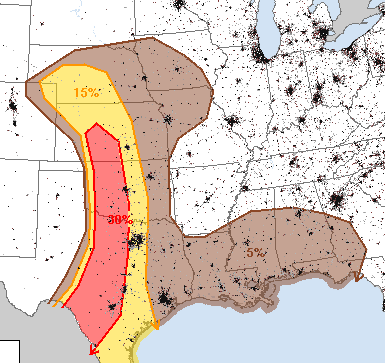 The large hail map (≥1") has a significant threshold of 15% (yellow). In the yellow and red areas, I suggest you bring your car in and put away anything that could blow about.